The leading casino stocks are all trading higher this morning. It now seems that whenever the Shanghai Index (China) is higher the casino stocks seem to benefit from the Macao markets and trade higher on the session. 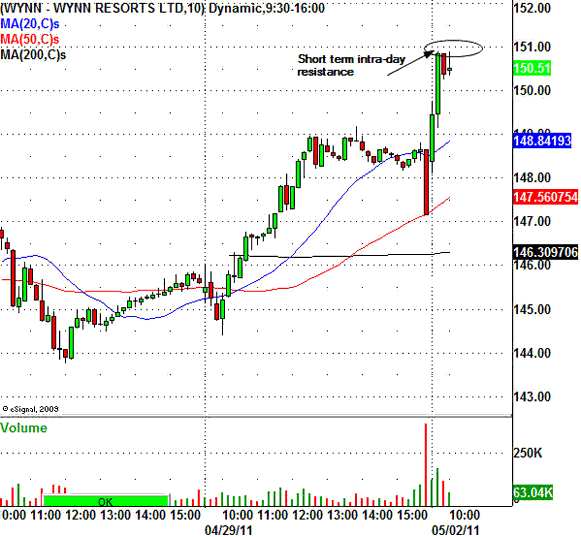 This morning Wynn Resorts Ltd. (NASDAQ:WYNN) is trading higher by $3.30 to $150.45 a share. WYNN is making a new 52 week high breaking out of a one week consolidation base. Traders can watch for intra-day resistance around the $151.00 and $151.50 levels. Traders can watch for small intra-day pullbacks from these levels. Las Vegas Sands Corp. (NYSE:LVS) is trading higher by 0.71.cents to $47.75 a share. This stock has had a tremendous rally since making a pivot low on March 15, 2011 at $36.00 a share. LVS should have some intra-day resistance around the $48.00 area. This stock is very strong today and the intra-day pullbacks could be minimal. MGM Resorts International (NYSE:MGM) is trading higher by 0.20 cents to $12.86 a share. This stock does not have the same relative strength as WYNN, or LVS on the charts. MGM stock is trading near the lower end of the daily chart. The stock is still trading below the 20, and 50 daily chart moving averages, this formation puts this stock in a weak technical position. Short term traders can watch for intra-day resistance around the $12.95, and $13.06 levels.